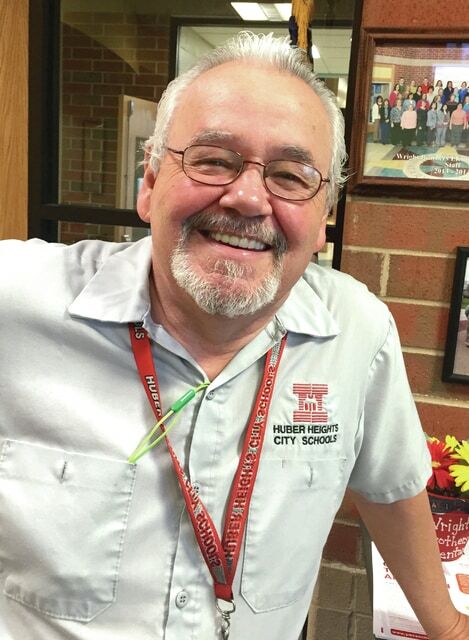 HUBER HEIGHTS —School janitor isn’t always a job that gets a lot of recognition. So when custodian Bill Sanders found out that the staff at Wright Brothers Elementary School nominated him for the Cintas Janitor of the Year award, he was stunned. The voting for the award is open to the public through April 15. You can vote for Sanders here. Kind, positive, thoughtful and always willing to go the extra mile — that’s how teachers at Wright Brothers Elementary School described Sanders when they nominated him for the national award. And it’s not hard to see why. In addition to keeping the building clean and safe, Sanders delivers more than 100 “love in a bag” gifts to students every Friday to make sure they have something to eat over the weekend. He’s also been known to dress up as the gingerbread man — in a costume he made himself — and run around on the roof of the building to entertain students in spite of his extreme fear of heights. Hosted by Cintas Corporation, the Janitor of the Year Contest shines a spotlight on those who work behind the scenes year round to make schools a clean and positive place to learn. Online public voting determines the winner of the $5,000 cash prize. The winning janitor will also receive $5,000 in products and services for his or her school from Cintas and Rubbermaid. Sanders is one of 10 finalists from across the country. The other nine finalists will receive $500. The school staff who nominated him also added that Sanders is not only concerned with student safety and happiness, but that he looks after staff and visitors to the building as well. He can often be seen walking teachers to their cars at night and after conferences. Sanders is grateful for the recognition and said that he is inspired by the positive atmosphere created by other district staff members. To vote for Sanders, click here. Voting ends April 15. Custodian Bill Sanders was nominated for Cintas Janitor of the Year by the staff at Wright Brothers Elementary School where he not only keeps the building clean, but he does his best to keep staff and students safe and happy. The community can vote for Sanders to win $5,000 by visiting www.cintas.com/JOTY through April 15.